JON STRIDER MUSIC IS NOW AVAILABLE ONLINE at BandCamp. Listen and Buy! Go to Link Below. 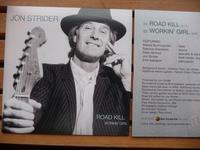 Front & back covers of the "Road Kill / Workin' Girl" CD. Released in February 2013. Listen, stream and buy Jon Strider recordings at BandCamp: "Road Kill / Workin' Girl" (2 singles, 2013), "Fresh Tracks" (2010), "White Wings" (2005), and "2000 Calling" (1999) up there. Next up will be "Kindred Way Vol. 2" (1994), "Kindred Way Vol. 1" (1993) and "Strider...steps out" (1990). For physical CD purchases go to www.bluedesertmusic.com or pick one up at a Strider live show. ...that the Sargasso Sea also is an international meeting place for eels. Drawn by unknown forces, the snakelike fish come from Europe, the Mediterranean and the United States to mate, spawn and die. From there, their larvae make the long journey back to continental waters.